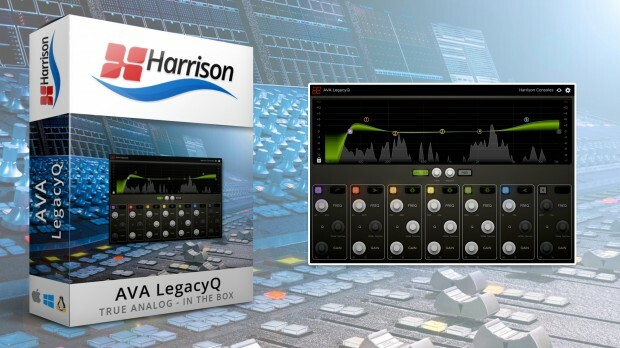 Harrison Consoles release AVA LegacyQ Equalizer. Based Harrison’s original MPC digital equalizer and used in ultra high-end post & film facilities, it is available today and on promo until September 15, 2018 at the DontCrack Store! Harrison’s reputation for “True Analog In-The-Box” sound is due to their unique development heritage; first creating an analog console processor and then converting the processor to digital while retaining the sound and character of the original analog console. The new AVA LegacyQ is a plug-in version of Harrison’s original MPC digital equalizer, it began life as a digitally-controlled analog circuit and was later adapted to digital while being used in ultra high-end post & film facilities worldwide. Like the original, the AVA LegacyQ is optimized for use with control surfaces. Each band covers a limited range equivalent to its original analog counterpart, and the “Q” shape is designed to optimally match the operating range of a physical knob. A high-resolution spectrum analyzer is also provided to pinpoint specific frequencies that need adjustment. Harrison’s first full featured digital EQ in a plug-in. 5 parametric EQ bands with selectable shape. 2 filters with selectable shapes (including Harrison’s wide-bottom notch for fast & accurate repair work). Harrison’s custom 4-octave frequency ranges; first developed for the 32C console in 1975. Harrison’s custom “Q” knob is optimized for use with control surfaces. High precision RTA analyzer retains full resolution in the low frequencies. 5 EQ bands and 2 filters are provided for optimum compatibility with Avid control surfaces. EQ curve appears on Pro Tools mixer window, and control surface displays (AAX only). This entry was posted in DontCrack, Event, Plug-ins, Promotions and tagged AAX, AU, AVA, Digital EQ, EQ, Equalizer, Filter, Harrison, Harrison Consoles, LegacyQ, Linux, Model, MPC, Parametric, VST, VST3. Bookmark the permalink.